Lucia obtained a B.A. from the Universidad Autonoma de Madrid in Spain, where she trained with Gonzalo Garcia de Polavieja. After a summer working on vision in box jellyfish in the lab of Dan Nilsson at Lund University in Sweden, she joined Michael Bate‘s group at the University of Cambridge, UK for her PhD, where she studied the embryonic development of the Drosophila olfactory system. For her postdoc she worked on the evolution of olfactory pathways in Drosophila, in the lab of Richard Benton at the University of Lausanne, Switzerland. 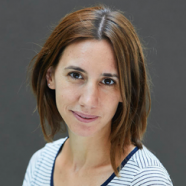 Since January 2018 she is a group leader at The Francis Crick Institute in London, UK. The focus of her lab is to understand how neural circuits evolve to generate species-specific behaviours using the olfactory system of flies as models. She has received multiple awards, including the FENS EJN Young Investigator Prize 2018 and the 2018 L’Oreal-UNESCO for women in science Fellowship. In addition to the lab work, Lucia co-founded and runs TReND (Teaching and Research in Natural Sciences for Development) in Africa, work for which she received the Passion in Science Award 2016. The central question to my research is: How do nervous systems evolve? The diversity of animal behaviours we observe today is a product of evolution, yet we know little about how random mutations, drift and natural selection shape nervous systems. Harnessing the rich ecological diversity found within the Drosophila species complex, and using their olfactory system as models, we try to address this question by using a multidisciplinary approach. In the lab we combine neuroscience approaches such as neural circuit tracing, electrophysiology and calcium imaging across different fly species, with evolutionary and ecological approaches, including field collections of odours and flies and population genetics. Using this approach, in my postdoctoral work I uncovered important principles in the evolution of olfactory receptors. We now plan to extend this work to look into how evolution shapes central olfactory circuits.